We’re quickly approaching the pinnicle of the holiday season; chances are, you’ll be spending some quality time away from work with family and friends. Do you have the tools you need to document the special occasions of the season? It could be as basic as your cell phone camera! For those looking to go one step further and break out the fancy cameras and wow with new skills, we’ve got the courses to help you master home video and digital photography. Become the digital hero of your office party and family gathering. Make sure all the memories of this holiday are captured beautifully (don’t look back on blurry pics and shakey video!). Overwhelmed by Windows Movie Maker or Apple iMovie? Learn to create home videos everyone will want to watch with tips on editing, using effects and transitions, as well as how to improve sound. Impress your friends and neighbors with your professional-level videos. 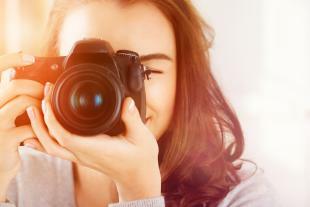 Want to take your digital photography skills to the next level? Don’t miss this engaging three-part series on the fundamentals of photography. Perfect for beginners, this course will help you move away from automatic mode and take manual control to shoot beautiful photos! Ready to take amazing pictures with your dSLR camera? This course, designed to help you use your camera to its full potential, covers many topic areas including exposure and focus, composing your shots, and ways to share your photos. Become an digital expert today!